Wildfires are not uncommon when you live in California—and that’s a scary thing for some children to grasp. We spoke to two experts at Children’s Hospital Los Angeles—pulmonologist Shirleen Loloyan Kohn, MD, and psychologist Stephanie Marcy, PhD—to get tips on keeping your whole family safe and sound in the event of a wildfire. For those close to an affected fire area, how should they keep their family safe from the smoke? Shirleen Loloyan Kohn, MD: Stay indoors as much as possible, with the windows closed, use a HEPA filter if you have one, and leave your air conditioning turned off. If you need to go outdoors, Wear an n95 mask if you go outdoors and make sure it fits properly. Kid sizes are available and you can find the masks at a hardware store; the Red Cross or local hospitals may carry them as well. If you can, please go to areas with good air quality, even if for a few hours, to give your lungs a break. Please don’t play in the ash or try to clean it up (such as with a leaf blower), as this stirs up pollutants. Contact your local Red Cross to get good instructions on cleaning up after a fire. Also, it is recommended to look up the air-quality index in your region. The ash is visible, but there are pollutants in the air you cannot see. Visit AirNow.gov to check. What about those with breathing issues such as asthma? SLK: If possible, get out of town to an area with good air quality. If not, stay indoors with the same measures as above. Those with asthma should make sure to have extra rescue inhalers or nebulized medication (such as albuterol) on hand. Who would be most affected by smoke? SLK: Those with chronic disease (such as chronic lung or heart disease); younger children and babies, as their airways are smaller and lungs are developing; and older adults. Are there are any products that a family should look into getting for their home? SLK: A HEPA filter or air purifier can help, but if these are unavailable to you, stay indoors with the windows shut and air conditioning turned off. What is the best way to explain these natural disasters to your child? Remain calm and in control, and avoid being dramatic or overly emotional. Reassure them that you will protect them and keep them safe. Try to let the discussion be child-led. Encourage them to share what they know, think or fear so that you can properly correct misconceptions or inaccuracies. Avoid watching upsetting or scary news footage repeatedly, or at all, as this will add to the anxiety and fear for your child, as well as yourself. Sometimes it may be best not to expose your young child to scary and bad events at all if it is unlikely that they will learn about them otherwise. If you do feel it important or necessary to discuss these events with your child, keep his or her developmental level in mind. Very young children tend to be very concrete, and do not have a good understanding of time, distance, cause or space. So, keep your explanations simple, avoid speculation, appeal to their curiosity to aid in distraction, and focus on reassuring their safety and that of others by emphasizing those people or things that are helping. What advice do you have to keep your child calm and maybe take their mind off it? SM: Children take their cues from the trusted adults around them. The first thing for parents to keep in mind is that they need to model calm and in-control behavior for their children in order to help keep them calm. Part of maintaining one’s sense of control and, thus, decreasing anxiety is familiarity. Thus, parents should try to maintain as much of the typical routine as possible. If a family is affected by a disaster and must leave home, try to give your child some sense of control if there is time to prepare. Ask them to pack their own bag with the things that are most important to them (this will also aid as a distraction while you focus on what you need to do). Make sure that you grab their favorite toy, trusted stuffed animal and comfortable blanket, so that even if they are not in their own bed, there are familiar items to aid in their comfort. If you do not have to evacuate but are still proximal enough to be impacted, try to stay out of the direct reminders (e.g., smoke, ash) as much as possible. Find fun projects to do indoors at home, go to a movie theatre or indoor playground, or pick a new recipe to make. Distraction is often an adaptive coping strategy for people of any age. How can you reassure your child that everything will be OK? SM: The first thing to keep in mind is that it is difficult to effectively reassure someone if you don’t truly know what they are afraid of. Thus, asking your child what they are afraid of, or what they fear happening, is a good start so that you can reassure their actual fear(s) and not provide empty reassurance that everything will be OK.
For younger children, you may wish to let them know on a need-to-know basis regarding potential loss or damage to their home or property. Focus on reassuring them of their safety, letting them know that you are prepared and in control and will make sure that everyone (including pets) are safe. For older children, particularly teens, it is more appropriate to provide greater details, as they can participate in planning and participation more in response to the possible threat, increasing their sense of control and decreasing terror and anxiety. If you are in an area that is at high risk for natural disasters, it is always a good idea to have a family plan in place long before the disaster hits. Involve the whole family in insuring that you are all prepared and have secured or at least thought about what is most important for each of you. Get a fireproof box that has irreplaceable or important items in it (birth certificates, passports, grandmother’s ring, video’s, backup hard drive, etc. ), prepare a disaster kit together with necessary supplies including several doses of prescription medications, test your smoke alarms, make a list of things to grab, etc. What if your family needs to evacuate? SM: Depending on how much warning and time you have to get out, do a quick triage of the situation. If you can, calmly divide up tasks among family members, with emphasis for your child on grabbing items that are important to him or her. As previously discussed, try to include things that will communicate “comfort” and “familiarity” to your child(ren) and to you, so that even though you will not be at home, you will have clothing, blankets, stuffed animals, favorite toys and a pillow that will enhance your comfort wherever you are. How would you explain when your child is seeing other people losing their homes, or even worse, loss of lives? SM: Again, depending on how old your child is, and what their past traumatic experiences have been, you will need to decide how much to expose your child to. If you are directly involved in a natural disaster and witnessing loss of life and home directly, focus on establishing safety, first and foremost. Keep them physically close, and steer them away from the danger and exposure to terrifying scenes as much as you can. 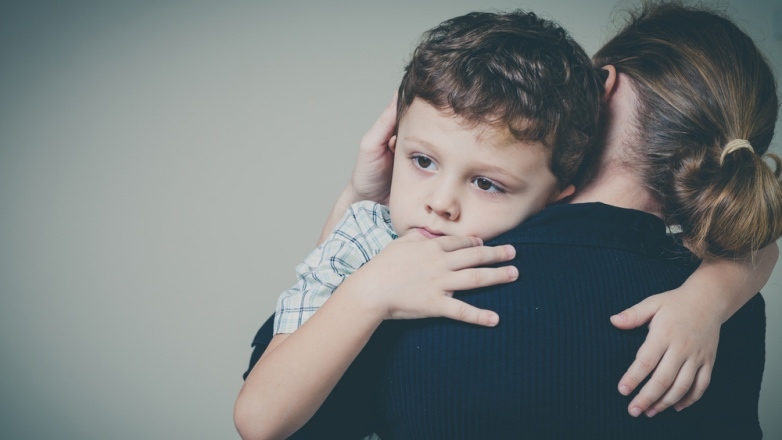 Once you and your child are in a safe place and imminent danger has passed, you can start to take emotional inventory and process the event with your child. Do not push them to speak about it if they are not ready, but demonstrate open communication, willingness to talk about whatever they need to discuss, and that no questions or topics are off limits. Do not feel that you have to be “strong” and hide your emotions entirely. It is appropriate to show your child that you are upset and that we are all entitled to our feelings. Try not to correct how they are feeling (e.g., “Don’t be mad, it’s nobody’s fault” or “Stop crying, you’re my brave little girl”). Prompt them for their understanding of what has happened and why so that you can give them accurate information and help them process adaptively. While distraction can be a very effective coping strategy, be careful to not to communicate to your child that you are avoiding talking about the traumatic experience or that it isn’t safe to discuss it with you. Reassure them that even if you cry when discussing it, it’s not their fault that you are crying, and that it is healthy and appropriate to talk about what happened together in order to begin healing. Finally, engage them in being part of the “help” process if possible.